Fresh ingredients equal incredible flavors. This is why I love summer, it doesn’t take much to make an amazing meal. The other reason I love summer… cherry season! Cherries are such a versatile fruit they can be made sweet or savory and it takes only a few ingredients to transform them. 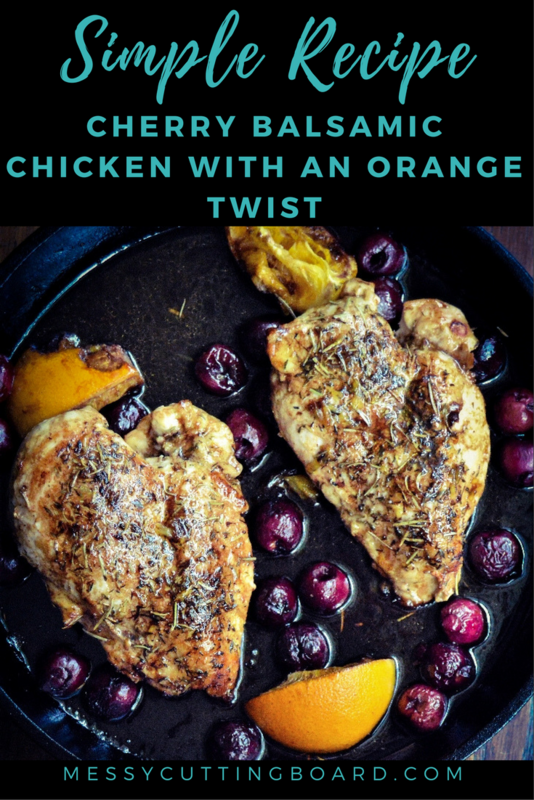 Today we are going savory and making Cherry Balsamic Chicken with an Orange Twist. Okay, mom’s you know there are those days we mom so hard, those days we get all the dishes done, the laundry cleaned and folded, the meal planning, house spotless, and we actually are productive at our stay at home jobs while juggling a hundred questions our kids are asking us. WE OWNED THAT DAY!! Nap time was on time!! I had one of those days once…. I found myself eating lunch in the peace and quiet… it freaked me out, as moms, we typically associate silence with the kids are getting into some trouble. However, I knew mine was napping, so I grabbed my phone to distract me and of course, I mindlessly scroll through my Instagram and Facebook as well as responding to comments and then I pull up Pinterest. I have a love hate relationship with Pinterest. Every time I pull it up I see an incredible photo of an amazing recipe then it re-buffers and the photo with the incredible recipe is gone, I scroll and scroll, search key words and it is lost in the Pinterest world until it wants to show its face again. But, this day the picture was so inspiring!! 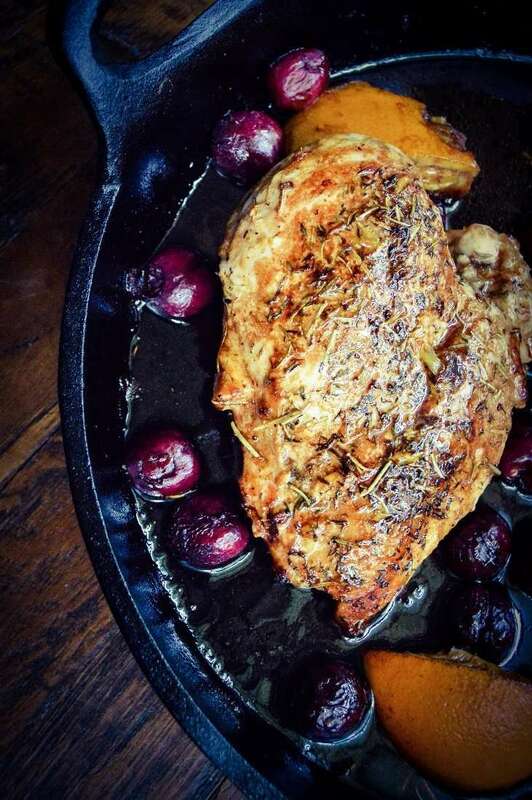 This picture was a stunning photo of chicken in a skillet with rosemary and cherries and I swore it said balsamic in the title. That was it folks… dinner plans changed that moment. 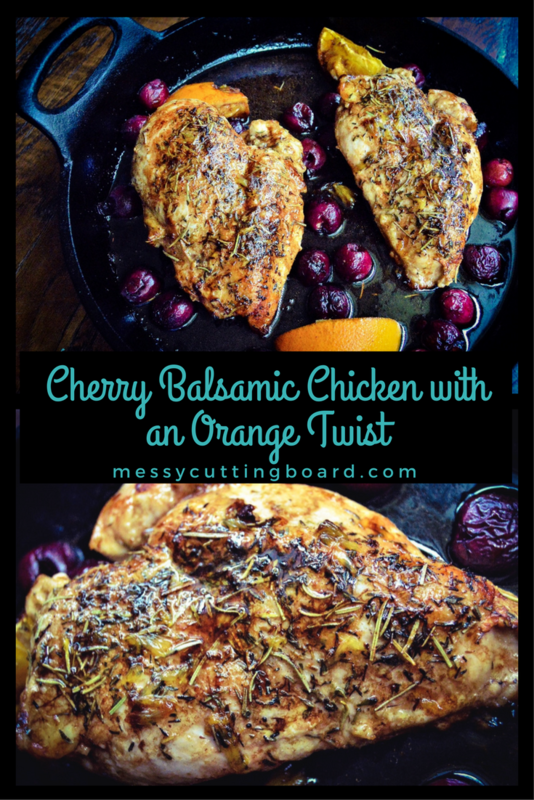 Bring on the Cherry Balsamic Chicken with an Orange Twist! Bonus for once I already had all the ingredients and I didn’t have to run to the store!! I started by pouring myself a nice glass of wine, it helps get my creative juices going.Now time to make the sauce, in a large measuring cup I added pitted cherries, balsamic vinegar, garlic, fresh rosemary, and thyme, but I felt there needed to be more juice. Chicken stock would work, but I wanted more flavor something with a little tang. Oranges!! I took one orange and juiced it, then I decided to use the whole orange, I cut the halves into quarters and ended up cooking that as well. 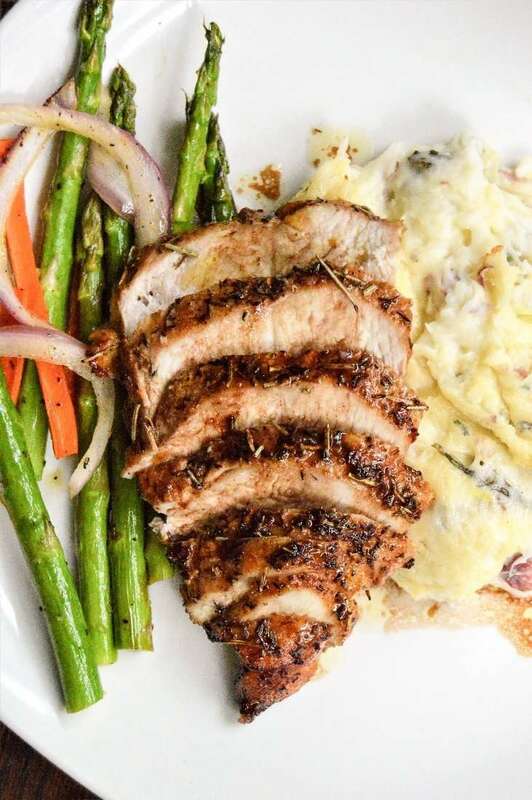 A simple spice blend with dried rosemary, thyme, garlic, salt, and pepper was perfect for the outside of the chicken and would help enhance the flavor of the sauce. Sprinkle one side of the chicken evenly with the spice blend. (I like to use a cast iron skillet for any dish that I am going to start on the stove and move to the oven.) Butter the bottom of a skillet and over medium heat place the seasoned side of the chicken down in the skillet, and sprinkle the simple spice blend on the bare side of the chicken. Allow the chicken to brown, try not to move it too much (typically takes 3-6 minutes). Once the first side has browned flip the chicken, pour the sauce with the pitted cherries, balsamic vinegar, fresh herbs, garlic, orange juice and oranges in with the chicken. Before placing the skillet in the oven drizzle honey over everything, then place skillet in the oven for 10-15 minutes to finish cooking. The internal temp of your chicken should be 165 degrees Fahrenheit (75 degrees Celsius). 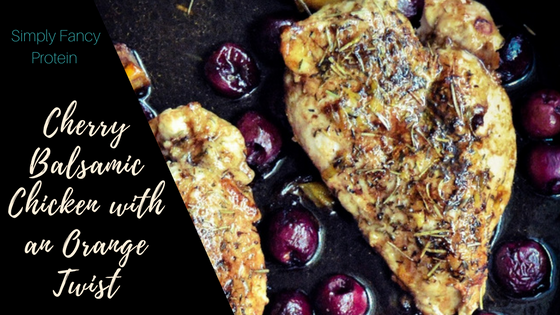 Remove the Cherry Balsamic Chicken with an Orange Twist from the oven, take the chicken out of the pan and let rest for 5 minutes. Now check your sauce. There have been a few times I made this recipe the sauce was really runny and thin. What you are looking for is if you stick a stainless steel spoon in the sauce that it coats and kind of stays on the spoon…slowly running off. You don’t want it to run like water. If yours is too thin simply place the skillet back on the stove bring the sauce to a boil over medium-high heat and cook off some of the excess liquid. It takes only 1-3 minutes so make sure you watch it closely. If you cook it too long it turns more into a glaze. Now that the chicken and sauce is ready, slice the Cherry Balsamic Chicken with an Orange Twist drizzle over the top with sauce and serve. Recommended sides Onion and Chive Whipped Potatoes and Garlic Honey Roasted Asparagus and Carrots. In a small bowl combine the dried thyme, dried rosemary, garlic powder, and salt to make the seasoning for the chicken. Lay chicken out on a cutting board and sprinkle one side with the seasoning from the small bowl. In a cast iron skillet place olive oil and melt butter over medium heat. Place the chicken breasts seasoned side down. Season the other side of the chicken. Allow chicken to brown before flipping 3-6 minutes. Flip chicken and pour contents from the large measuring cup in with the chicken. Drizzle top of chicken with honey. Place cast iron into the oven and allow to bake 10-15 minutes. Internal temp of the chicken should be 165 degrees Fahrenheit (75 degrees Celsius). 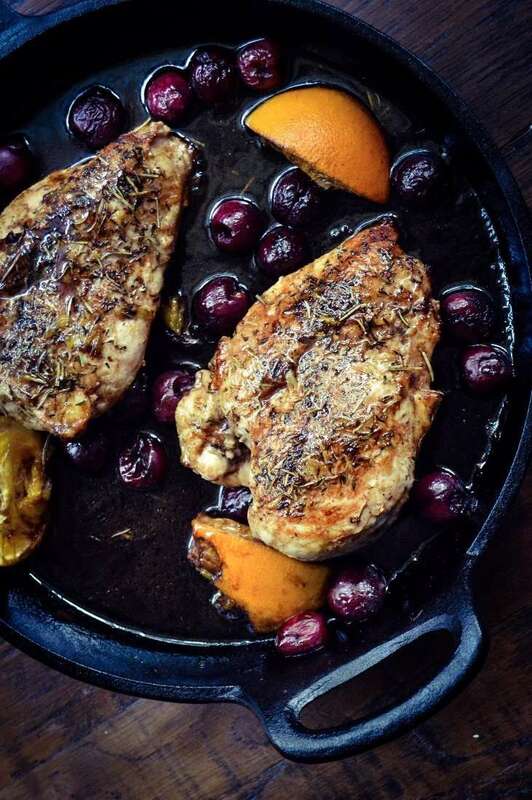 Remove the cast iron skillet from the oven, take the chicken out of the pan and let rest for 5 minutes. If the sauce is too thin (see recipe Notes) simply place the skillet back on the stove bring the sauce to a boil over medium-high heat and cook off some of the excess liquid. It takes only 1-3 minutes to make sure you watch it closely. If you cook it too long it turns more into a glaze. Slice chicken and drizzle sauce over the top and serve. When it comes to the sauce the best way to test it out is to stick a stainless steel spoon in the sauce if it coats and kind of stays on the spoon...slowly running off your good.